Like Everything Bagels? You’ll Love Everything Bread! 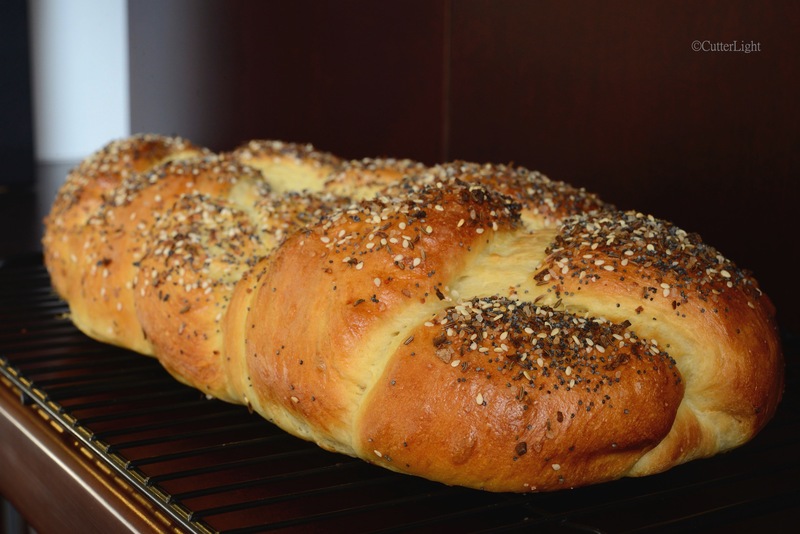 Braided bread topped with anything you’d like! We topped ours with smoked sea salt, sesame seeds, caraway seeds, poppy seeds, and dried minced onion. In a large bowl, whisk together warm milk, water, and yeast. Add butter, sugar, egg yolk, salt, and 2 cups of flour. Mix together well. Add another cup of flour and mix thoroughly. Add another cup of flour and mix thoroughly again. Knead in remaining 1/2 cup of flour until dough is smooth and elastic, about 6 minutes. Place dough in large oiled bowl. Make sure to roll the dough so that entire dough ball is lightly covered in oil. Cover bowl with plastic wrap and let rise until doubled, about 1 hour. Punch dough down. Turn dough onto lightly floured surface and divide into thirds. Roll each third into a long rope, about 20 inches long. Place ropes on a parchment-lined baking sheet. Pinch one end of ropes together and braid remaining strands. Pinch together both ends firmly, so that braid doesn’t come undone. Cover and let loaf rise until doubled, about 45 minutes. Preheat oven to 375 degrees F (about 190 degrees C). Combine salt, onion and seeds in a small bowl. Brush loaf with egg white. Sprinkle salt combination evenly over loaf. Bake loaf for about 22 minutes. Loaf will be golden brown. The smell will delight you. Let loaf cool on a wire rack before serving. ← Almond Matcha Tea Butter Cookies: Zip, Bang, Yum! Thanks! Why not give it a try? Thanks Chef! This may be our new favorite bread!